The Knitting Pirate » In Which the Pirate Works on the Blanket. In Which the Pirate Works on the Blanket. 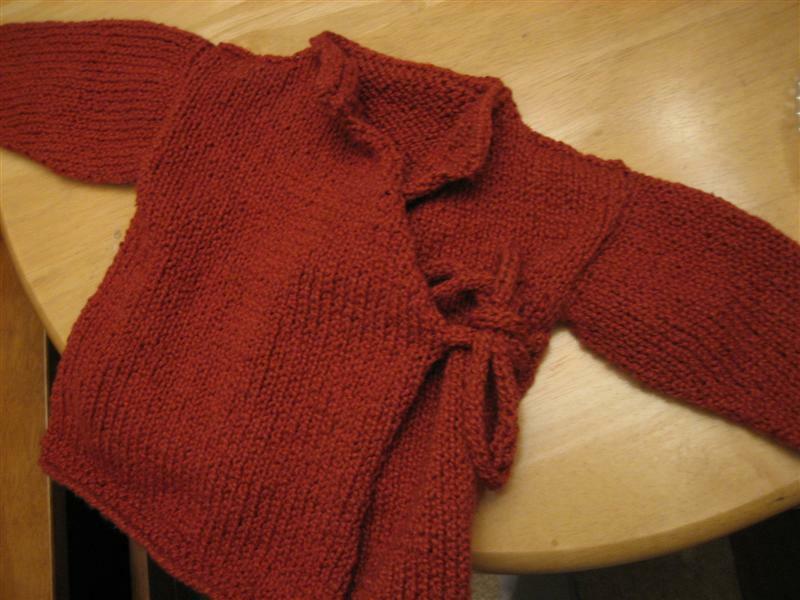 I have five pattern repeats done, and approximately fifty-five to go. I will need to work on this blanket for more than an hour every day if I want to have it finished in time for the (as yet unscheduled) baby shower. Unfortunately my time knitting in the car has been cut, as my boss's hours have changed and we're not currently carpooling. There's a possibility that we'll figure something out soon, but for now I have to drive myself to work every day - how frustrating! I knit this Baby Yoda Sweater (Ravelry link) for the older sister of the upcoming baby, and this week my friend remarked on how the new baby already had a hand-me-down handknit sweater to wear. It may be a little selfish of me, but I love knowing that the recipients of my knitted gifts appreciate the time and work that goes into them. I do remember why I swore I'd never knit another baby blanket, though. They seem to go so slowly! Perhaps it's good practice; eventually I would really like to knit a bedspread for myself, at least queen-size if not king. I do love the Lizard Ridge pattern, and have daydreamish images of knitting squares with friends and then sewing them up. But who would own the finished project? I think I'll have to do it all myself. This entry was posted on Tuesday, August 12th, 2008 at 12:28 and is filed under Baby M Blanket, babyclothes, gifts. You can follow any responses to this entry through the RSS 2.0 feed. Both comments and pings are currently closed. 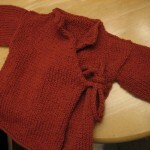 Love the baby sweater - the design really suits the strong colour that you have chosen for it.